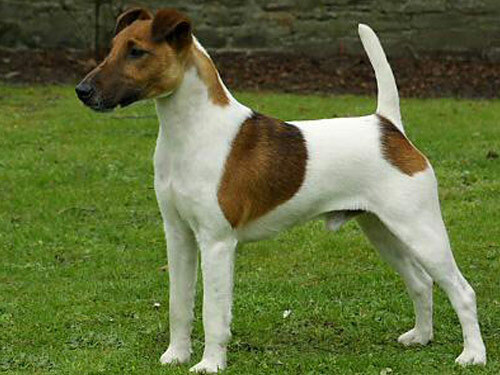 Considered to be one of the oldest terriers, this breed originated in 18th century England as a foxhunter and ratter. Though not as popular as other terrier breeds, they are well known and established. Today the Smooth Fox Terrier is primarily a family companion and show dog. The Smooth Fox Terrier is a well-proportioned, active, cheerful, and independent breed. They are elegant, eager, compact, and extremely courageous. This is a bold and daring breed that is not easily intimidated and possesses both beauty and brains. A loyal and deeply devoted breed, the Smooth Fox Terrier is also loving and affectionate. They thrive on companionship and attention and do not do well if ignored or are left alone for extended periods of time. This breed does best in a home with older considerate children. Regarded as one of the most aggressive breeds they are not suited for homes with other pets. They are wary of strangers and make excellent watchdogs. Smooth Fox Terriers are not recommended for the novice, apathetic, or sedentary owner. The Smooth Fox Terrier needs occasional brushing with a firm bristle brush and professional stripping of the coat twice a year. Bathing or dry shampooing should be done when necessary. This breed is prone to such health issues as deafness, postnasal drip, cataracts, Legg-Calve-Perthes disease, lens luxation, and distichiasis. The coat of the Smooth Fox Terrier is dense, short, flat, and smooth. It is also quite abundant and covers not only the entire body, but the stomach and underside of the thighs as well. The color of the coat is predominately white with black or brown markings. This breed is an average shedder. This breed requires early intensive and extensive socialization and obedience training. The Smooth Fox Terrier is willful, will challenge authority, and attempt to be dominant. They are prone to excessive barking. They will not respond to harsh or heavy-handed methods but must have an experienced owner and handler. Training must be done with firmness, fairness, consistency, and patience. The Smooth Fox Terrier displays talent in agility, fly ball, tracking, and hunting. Boisterous and playful, the Smooth Fox Terrier requires daily physical exercise and mental stimulation. They benefit from and enjoy securely leashed walks, family play sessions such as ball and Frisbee, and a safely fenced area to freely romp and run in. Smooth Fox Terriers will become destructive and bark incessantly if bored or lonely. They will do okay in an apartment provided they are given sufficient exercise, attention, and stimulation.